Baked donuts, without all the fat? What’s not to like? 1.3 miles. That’s how far away the closest Target is to my house, and according to Google, it only takes 3 minutes to get there. Do you know what this means? It means I spend a ridiculous amount of time there, which probably also translates to a ridiculous amount of cash. I can pretty much buy almost everything I need there, and everything I don’t need, including a cute little 6 count donut pan! While I was “bumming around” Target last week, trying to kill some time, I stumbled upon this cute little donut pan and had to buy it. The thought of baked donuts, without all the fat, sounded appealing to me. And when I saw that the bake time was about 10 minutes, I knew these baked donuts would be a winner in our house! To start, I chose a basic plain donut recipe that you could adapt so many ways with different glazes and toppings. You could simply dust the donuts with powdered sugar, dip them in melted butter, and then into a cinnamon sugar mixture, or you could take the route I did and make a homemade chocolate glaze! I had never had baked donuts before, and they are definitely different than their fried sibling. The texture is different, almost more cake-like. Some might even think that it’s ‘dry’ due to the lack of grease, but truthfully, I was pleasantly surprised at how much I enjoyed these little guys. Pre-heat your oven to 325 degrees. In a large bowl, combine flour, sugar, baking powder, and salt. Mix well. Add in eggs, vanilla, milk, and shortening and stir until all ingredients are incorporated. Spray your donut pan lightly with cooking spray. Fill each cup about 3/4 of the way full. Bake for 8-10 minutes, or until donuts are cooked completely. Leave the donuts in the pan for a few minutes, then move them to a cooling rack to cool completely. To make the glaze: Place the butter, milk, corn syrup, and vanilla in a large microwave safe bowl. Microwave for 1-2 minutes, until the butter is melted. Stir in chopped chocolate and continue stirring until it has completely melted. Whisk in powdered sugar and stir until you have a creamy, smooth glaze. If the glaze is starting to cool too fast, microwave the glaze for about 30 seconds. 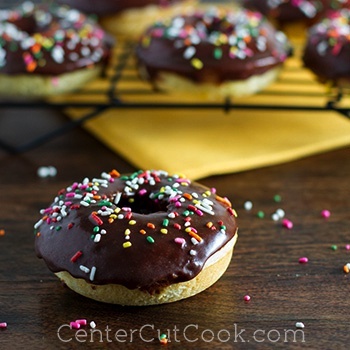 Dip each donut into the warm glaze, top with sprinkles, and allow to set for about 30 minutes. This recipe yields 12 donuts.